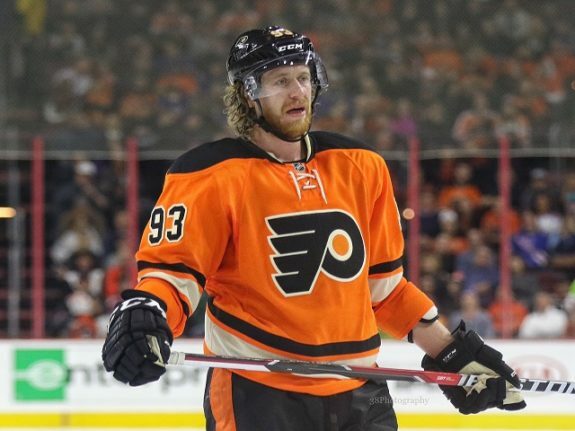 It’s a quarter of the way through the National Hockey League season and the Philadelphia Flyers seem to be going nowhere fast. At 9-9-2, the team is currently riding a three-game losing streak. With lots of questions surrounding multiple aspects of the team, it looks like the Flyers themselves could be their own worst enemy. One of the first things that comes to mind when the Flyers are mentioned is toughness. However, it seems as if the days of the Broad Street Bullies may finally be gone for good. Philadelphia is one of just two teams in the NHL without a fighting major this season — the other being the Arizona Coyotes. Fighting itself has declined in recent years, but with players like Wayne Simmonds and Radko Gudas it’s a wonder they, nor any of the team’s players, have dropped the gloves yet this season. As per NBC Sports’ Pro Hockey Talk, “Philadelphia isn’t a small team, with players averaging 6-1 and 198 pounds.” The article also quotes Jakub Voracek saying, ”I really cannot say that we are big and tough if we don’t have a fight yet.” With no fights on the score sheet as of now, will the Flyers’ toughness soon be called into question? Another self-inflicted wound ailing Philadelphia has been its special teams. At 16.2 percent, the power-play boasts a lower-tier spot at no. 24 in the league. In the last 10 games, the Flyers have just five goals on the man-advantage in 31 opportunities. Three of those goals came on Saturday against the Tampa Bay Lightning and marked the first time in four games the Flyers would score on the power-play. Even though the power-play found a glimpse of success, the penalty kill still brings the team down. At 68.6 percent and no. 30 in the league, Saturday’s game was no different. In a dismal outing for the short-handed groupings, Tampa Bay potted three goals on the man-advantage, thus sending the Flyers deeper into penalty kill peril. All-around, Philadelphia’s special teams have been very disappointing this season. With so much struggling going on throughout the Flyers’ system, perhaps it’s finally time to shake things up within the team’s organization. At this point in the season, the team is almost exactly where it was last year. As per NBC Sports Philadelphia, through 20 games in the previous campaign, the Flyers also boasted just a .500 record at 8-8-4. Teams with similar starts to the Flyers this season have already nixed their head coaches. The first to go was long-time Chicago Blackhawks coach Joel Quenneville about two weeks ago. Next, the St. Louis Blues canned Mike Yeo on Monday followed by the Edmonton Oilers relieving Todd McLellan of his duties just yesterday. 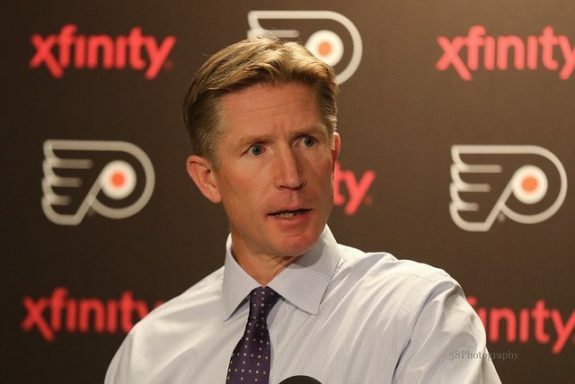 That being said, could Dave Hakstol be on the chopping block if things don’t get better for the Flyers? As of now, he’s the fourth-longest tenured coach in the NHL. However, he has yet to win a playoff series leading Philadelphia to two postseason appearances in three years of coaching. Penalty coach Ian Lapperiere has shown little success as well. Ever since his hiring during the 2013-14 season, the Flyers’ penalty kill has been mediocre at best finishing in the league’s top 20 just one time. In addition, assistant coach Kevin Knoblauch has yet to show anything for his coaching abilities on the power-play. Brought on to the coaching staff last June, he was highly-touted as a great hockey mind, having coached the OHL’s Erie Otters to much success. It seems like that success, at least in part, hasn’t carried over to the big league. There’s a lot to be said for how the Flyers have been playing this season, most of it being negative. A toughness factor, struggling special teams, and coaching questions all cloud the team’s fate going forward. It’s already difficult enough battling different NHL teams day in and day out, but battling themselves is something Philadelphia can’t afford to keep doing.